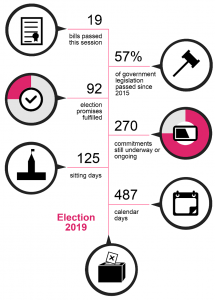 Since September 2017, the government has tabled 17 new pieces of legislation and passed 19 bills. The focus of the third year of the mandate has been to wrap up public consultations and begin moving forward with bills that execute on key election promises made in 2015, including electoral reform, increased environmental protection and a new carbon pricing framework. The most notable bills to pass this session were C-45 and C-46, legislation to legalize the recreational use and sale of cannabis. After many hours of acrimonious debate and negotiation between the House of Commons and the Senate surrounding controversial amendments aimed at blocking home cultivation, restricting the promotion of cannabis, and forcing financial disclosures on licensed cannabis producers, the Bill finally passed. Shortly thereafter, the Prime Minister announced that cannabis would officially be legal in Canada on October 17, 2018. Every year, the government also requires legislation to implement provisions of the federal budget. The recently passed budget implementation bill (C-74) included the federal government’s carbon pricing plan that will come into force January 2019. While most provinces have already signed onto the federal carbon pricing plan, Saskatchewan continues to challenge the constitutionality of the legislation in court, and newly elected Ontario Premier Doug Ford is promising to join suit. Other key pieces of legislation receiving Royal Assent this session include the long-awaited C-49 which amends the Canada Transport Act to modernize air and rail transportation, legislation enacting new preclearance rules at Canadian ports of entry, and an act to update political financing rules. Earlier this spring, the government also tabled a series of environmental bills that were years in the making. In addition to replacing the National Energy Board with the Canadian Energy Regulator, the environmental legislative package included bills to overhaul the Environmental Assessment Act, protect Canada’s coastal waters and fish and whale habitats, address abandoned ships and hazardous vessels, and further regulate the shipment of crude oil. Stuck at Second Reading is C-79, an Act to implement the Comprehensive and Progressive Agreement for Trans-Pacific Partnership between Canada. Given the high tensions around trade with the United States over the past several months, expect the government to make the passage of C-79 a top priority next session as Canada looks to broaden its trading relationships across the globe. Other key pieces of legislation that the government had hoped to pass this session but couldn’t quite get over the line include Bill C-71 to amend the Firearms Act by mandating tougher background check measures, Bill C-76 to modernize the Elections Act to apply stricter pre-election political spending rules, and Bill C-65 to better regulate harassment and violence in federal workplaces. The government was able to accomplish some important non-legislative goals during the spring. This includes the long-awaited rollout of the $950 million Supercluster Initiative, the launch of a National Pharmacare Panel, a $100 million agreement to reduce global plastics pollution, and the signing of bi-lateral infrastructure and agricultural agreements with the provinces. As we head into the summer and fall, trade relations with the U.S. will continue to take up a great deal of the government’s attention. A trade war, at least in the short term, appears to be inevitable with Canada set to implement countervailing tariffs on certain U.S. goods in reaction to the tariffs President Donald Trump imposed on Canadian steel and aluminum. Many observers believe the White House’s protectionist trade policy is at least in part being driven by the U.S. election calendar and the need for Trump to appear to be taking strong action in advance of midterm elections set for November. While talks to renegotiate NAFTA will continue, these political realities mean that reaching an agreement is unlikely in the near future. After his tax proposals took a pummeling last summer, Finance Minister Bill Morneau is not expected to unveil any significant tax changes or policy shifts this summer. He will, however, by the end of August, become owner of the Trans-Mountain Pipeline (through the Canadian Development Investment Corporation) unless the government can find private sector investors willing to take over ownership before then. On the political front, all parties have begun work on developing their platforms for the next election and MPs will are working to keep their candidate nominations. Incumbent Liberal MPs will be working to demonstrate they have met several standards in terms of fundraising, supporter identification and voter outreach so that they can be automatically re-nominated. Pre-election planning will start in earnest following the Conservative policy convention in Halifax at the end of August and the Liberals’ summer caucus scheduled for Saskatoon in mid-September. Expect the Liberals to continue a focus on the needs of middle-class families into 2019 as they work to bolster the coalition of voters that delivered them a majority in the last election. With a new Conservative government in Ontario and the strong possibility of parties more antagonistic to the Liberal government winning upcoming elections in Quebec and Alberta, we anticipate the federal-provincial relations to become even more challenging for a government already in a pipeline battle with the B.C. government. Quebec will continue to be a key target for the Trudeau government which sees expanding their seat count there as one of the best paths to maintaining their majority government. We expect the Prime Minister to make Quebec a priority for his summer tour and government announcements particularly given that the provincial election will limit what the federal government can do there in the fall. Also, expect the Prime Minister’s tour to put a focus on highlighting support for sectors of the economy that are currently under pressure due to US trade policy. The Conservatives also see opportunities in Quebec and are specifically targeting nationalist voters, especially since recent by-elections have shown a collapse in the vote for the NDP and the Bloc Quebecois. The Liberals are gunning hard to win the NDP-held riding of Outremont in Montreal where a byelection needs to be called before the end of the year. In the fall, the government will start debate on accessibility legislation for Canadians with disabilities which was tabled just before the House of Commons adjourned for the summer. The government is also expected to introduce pay equity legislation, targeted at the public service, federally-regulated industries and federal contractors. They are also expected to put a focus on their Digital Government agenda and continue to shift more and more services online, while at the same time examining ways to protect the digital privacy of Canadians better. Addressing climate change through carbon pricing will remain a key priority for the federal government even as provincial governments like those in Saskatchewan and now Ontario say they will oppose the federal plan. With cannabis legalization now set for mid-October, the government will be working with provinces to try to ensure a smooth and uneventful transition to the new regime. Pre-budget consultations will be launched in the fall with an eye to shaping the pre-election budget next spring. We expect the budget to focus heavily on pocketbook issues for middle-class Canadians and to include support for moving towards a national pharmacare program for Canada. Jackie Choquette is Vice President + Group Leader, Public Affairs of Hill+Knowlton Strategies in Ottawa, Ontario. Elizabeth Roscoe is Senior Vice President + National Lead, Public Affairs of Hill+Knowlton Strategies in Ottawa, Ontario.